Valentine’s Day is getting close and that means it is time to start filling out cards, crafting a cute as can be Valentine box to collect them in, and of course, select the treats to share at school! This year my daughter and I decided that all of her friends are sweet enough and we would share a treat that isn’t candy. I gathered 20+ Non-Candy Valentine Treats for the Class that are so much fun! I can’t think of a single child that wouldn’t be tickled pink with one of these fun treats! This post contains affiliate links. If you make a purchase I will earn a commission at no cost to you. These treat ideas are perfect for school; they are friendly for all kids, even those with food allergies and they are perfectly festive for the occasion. 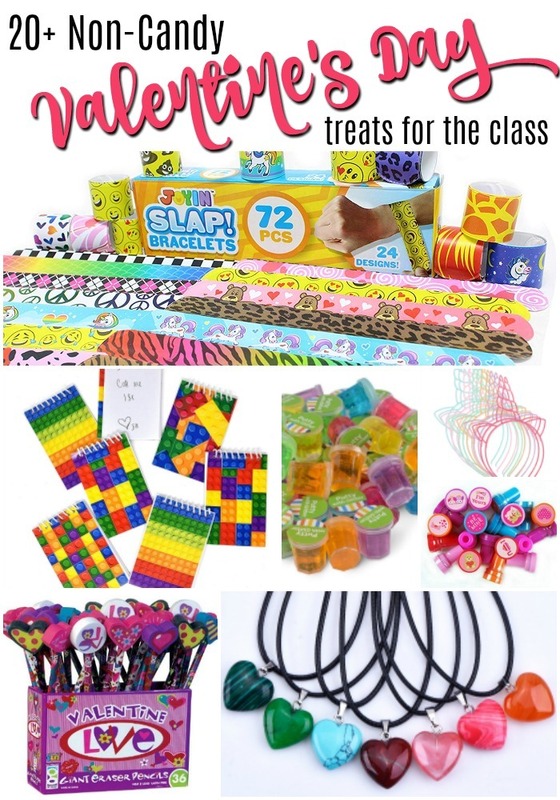 From always popular slap bracelets to adorable plush keychains this list has an idea for every classroom included! Which of these 20+ Non-Candy Valentine Treats for the Class do you think your kids would love to share with their schoolmates? We have decided to share the plush emoji keychains because they are really cute and quite affordable for such a large quantity. If you are ready to get crafty this Valentine’s Day, you will want to take a peek at my lovely DIY Valentine’s Day wreath craft. If you don’t have a budget for classroom treats this year, you might want to try your hand at these super easy glitter heart crayons which are the perfect use for broken crayons!